Known as one of the most intuitively adaptable trail bikes ever made, the Cadabra is the ultimate blend of efficient climbing and powerful descending. Featuring our new G3 Magic Link, which features an entirely redesigned rear triangle that's lighter, stiffer, with better tire clearance, a new Magic Air Auxiliary shock, and geometry that's slacker and lower, this is our fastest, stiffest and plushest Magic bike to date. Developed in conjunction with Kona Team Enduro athletes Karim Amour, Matt Slaven and Alex Stock, the 2013 Kona Scandium 6069 Cadabra is the ultimate all-mountain destroyer. View the Magic Link setup manual here. Known to be one of the strongest alloys in the world, Kona Scandium 6069 is featured in many of our high-end bike models, from dual-suspension mountain bikes through to some of our top-ranking asphalt rides. Comparable to carbon when it comes to weight, but exponentially more durable, Kona has always been a fan of Scandium and is one of the few companies in the world to use it so extensively. Scandium is a rare earth metal and potent grain refiner that, when added to aluminum alloy, elevates the strength and durability of the material by 50 per cent. Scandium aligns the grains of the alloy, making the metal less susceptible to failure. Scandium alloys are twice as strong as 6061 or 7005 Aluminum, which means our product team uses much less material. Because of a Scandium alloy's strength, it can be butted thinly enough so the aluminum gives a more compliant feel that's similar to steel but without weight. In more specific terms, we're shaving weight off our aluminum frames by 10 to 15 per cent, without sacrificing strength and durability. Introduced to our line in 2012, new Kona Scandium 6069 comes with yield strengths that are about 40 per cent higher than previous scandium alloys. The result is the strongest-per-weight aluminum alloy ever made. Because of its fibrous or fine-grained structure, Scandium 6069 alloy reveals a unique combination of high strength and toughness, good corrosion resistance and excellent fatigue strength. With the ability to change geometry, travel length and suspension performance based entirely on rider and trail input, Kona's patented Magic Link Active Geometry is one of the most intuitive and adaptable rear-travel suspension platforms ever invented. New for 2013, we introduce G3 Magic Link: lighter, smoother and more adjustable. View the Magic Link setup manual here. CLIMBING: Effective pedal pressure keeps the Magic Link's auxiliary shock from engaging, so the rider is only using the main shock. This results in good pedaling efficiency by enabling comfortable geometry and quicker, more linear suspension characteristics. Everything you need for good power transfer. CROSS-COUNTRY: Tire drag, faster corners and bigger bumps cause the Magic Link's Air Shock to move deeper into its travel. Chainstays elongate, the saddle and bottom bracket lower, and the headtube slackens, amounting to an agile, confident riding position, with increased wheel traction and plusher travel. DESCENTS: When the main shock and the auxiliary shock fully engage, Magic Link lets the bike's geometry slacken considerably, enabling the rider to position themselves further behind the bike, with a lower center of gravity and extended rear triangle for increased stability. Rear wheel travel also increases to 160mm, and the rear shock becomes more progressive to avoid bottoming out. VARIABLE SPRING RATE: One of Magic Link's more unique characteristics is its use of two shocks. 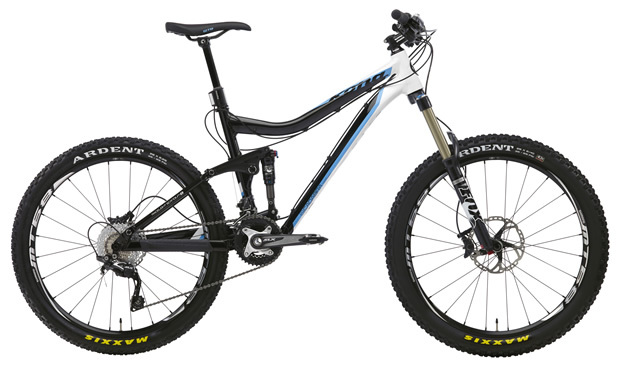 The result is a highly adaptable variable spring rate that enables the bike's rear suspension to be quick and short on the climb, and slower and more plush during the descent. Two shocks working together also allows the rear wheel to pop over big, sharp bumps with virtually no resistance. Because the main shock becomes more progressive as the link engages, it won't blow through the travel or bottom out. It's important to remember the auxiliary shock is in a constant state of flux depending on pedal (rider) and trail (terrain) input. New for 2013, we've replaced the standard coil auxiliary shock with our new Magic Link Air Shock. The most notable features of the new shock are weight savings, rebound adjustability, and ease of preload (spring rate) adjustability. If you thought Magic Link was the ride of your life, new G3 will blow your mind. To the linkage, we've added new cartridge bearings that are more durable and lighter, while incorporating a better trunnion attachment system, greatly increasing the overall stiffness of the linkage itself. The new G3 Magic Link-equipped Cadabra and Abra Cadabra feature a new tubeset that is noticeably stiffer and sexier. The rear chainstays are slightly longer, resulting in huge gains in mud clearance. Thanks to a seatstay bridge that is now in double shear, the lateral stiffness to the entire rear triangle is greatly increased. Based on feedback from our Enduro team, we've slackened the headtube to 67 degrees (one degree slacker than 2012) and lowered the bottom bracket by 10mm. The new Magic Link nest is nearly 100 grams lighter, slimmer and more compact. The result is a bike that's more confident on descents and quicker on the ups.